Step 1: Click on the Register Button at the top right-hand corner. Step 2: Key in your details & remember to select if you are from Singapore, Malaysia, Indonesia or elsewhere. Step 3: NuMoney will send you an email to verify that you have registered an account, Click on The Link to verify. Step 4: After verifying your account, you have successfully registered for an account with NuMoney Exchange. How to verify yourself on NuMoney Exchange? You would require verification to start trading/depositing/withdrawing on NuMoney Malaysia in MYR. You would require verification to start withdrawing on NuMoney Singapore & NuMoney Indonesia. Step 1: Login to NuMoney Exchange located at the top right corner of the screen. Step 2: Once you’re in, click on Account on the sidebar on the left. Step 4: The page will proceed to prompt you for these information. Step 5: Upload the needed documents accordingly and click on Verify. It should show that it is pending under the status bar. **Verification may take up to 2 business days on busy occasions but would usually be verified within a single working day. 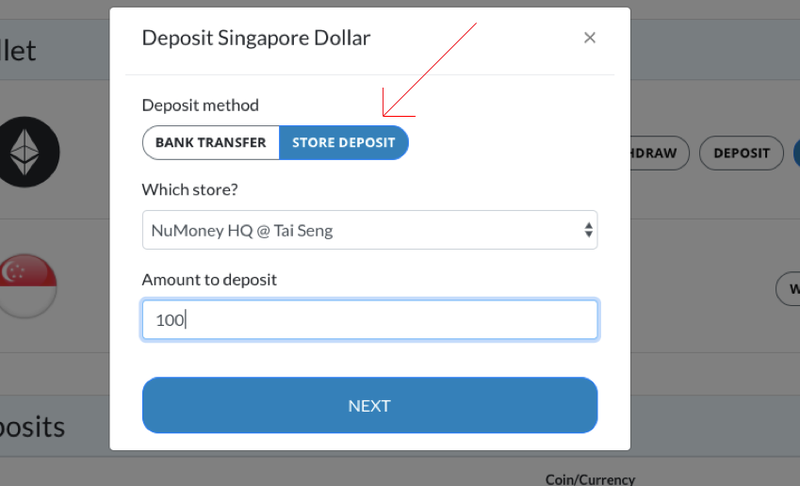 **Do take note that this function of Depositing with Cash is Only Available For NuMoney Singapore. Step 1: Login to NuMoney Exchange. 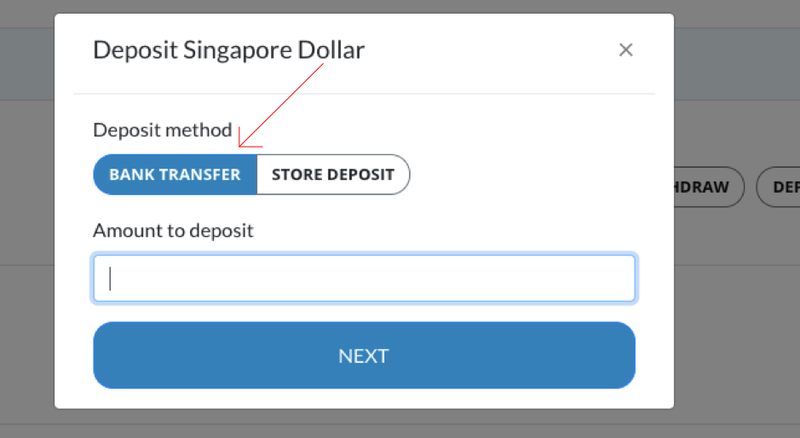 Step 2: Once you’re in, click on Deposit under Singapore Dollar. Step 3: The site will prompt you with the following. Click on Store Deposit, key in the amount you want to deposit and click NEXT. Step 4: The site will then prompt you to book an appointment. Select the available date and time for you to deposit your money. ** Do note that withdrawals in cash can only be done 1 business day later. Step 5: Be sure to show up on the date and time you have chosen. **Do note that the Minimum cash deposit is $50. To withdraw MYR, you would have to have a Malaysian bank account. To withdraw IDR, you would have to have an Indonesian bank account. to withdraw SGD, you would have to have a Singaporean bank account. Step 2: Go to Account and make sure that you have selected the correct currency. 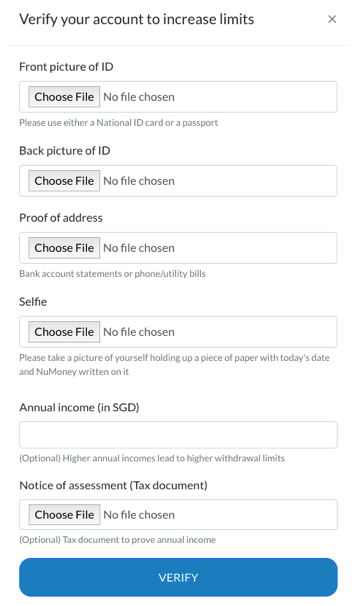 Step 3: Let's assume that you are depositing SGD into a Singaporean Bank. Click Deposit under Singapore Dollar. Step 4: The site will then prompt you with this information. Click on Bank Transfer instead of store deposit, key in the desired amount that you want to deposit and click NEXT. Step 5: The site will then prompt you with the bank transfer instructions. Follow the instruction on the screen to do the transfer. **It is very important for you to input the Transaction Memo/Note code into your transaction comments so that we can track your deposits. Bank deposits will be reflected within 2 working days. Bank deposits are processed manually during business hours from 10am to 6pm daily. Deposit SGD/MYR/IDR to your NuMoney Exchange account. Select Markets from the sidebar. Select which market do you want to trade in and click Open Market. Enter Price at which you want to buy ETH in Price. Click on Last, Ask or Bid to automatically input their corresponding prices. The Bid price shows the highest price someone is willing to buy the coin, at this moment. The Ask price shows the lowest price someone is willing to sell the coin, at this moment. The Last price is the price at which the last transaction went through at. Enter Amount of ETH you want to buy in Units. Click on Place Order to send the order in. Wait for the order to be fufilled. Deposit ETH to your NuMoney Exchange account. Enter Price at which you want to sell ETH in Price. Wait for the order to be fulfilled. One fulfilled, it will show at the bottom of the page as shown below. Enter the amount of SGD/MYR/IDR you want to spend to purchase ETH, this is the most straightforward way to purchase ETH from NuMoney Exchange.The prices will be determined by CoinMarketCap prices. Enter the amount of ETH you want to sell, this is the most straightforward way to sell ETH through NuMoney Exchange. The prices will be determined by our Rate calculator. A sell order is created with a price determined from the Rate calculator. (**Note: this might not be the best possible price) This is a convenient way for beginners to buy/sell quickly without worrying about prices. To withdraw MYR, you would require a Malaysian Bank Account. To withdraw IDR, you would require an Indonesian Bank Account. To withdraw SGD, you would require a Singaporean Bank Account. Ensure that you are in the correct currency. Click Wallet on the sidebar. Select Bank Transfer and choose bank account that you wish to withdraw to. Enter the amount in SGD/MYR/IDR you wish to withdraw. **Minimum of SGD1,000 for NuMoney Singapore. Enter your OTP (Google Authentication/Authy App). Your funds will be transferred to your bank account within 5 business days. Select Store Pickup, and Choose the store you wish to withdraw cash from. Enter the amount in SGD that you wish to withdraw. 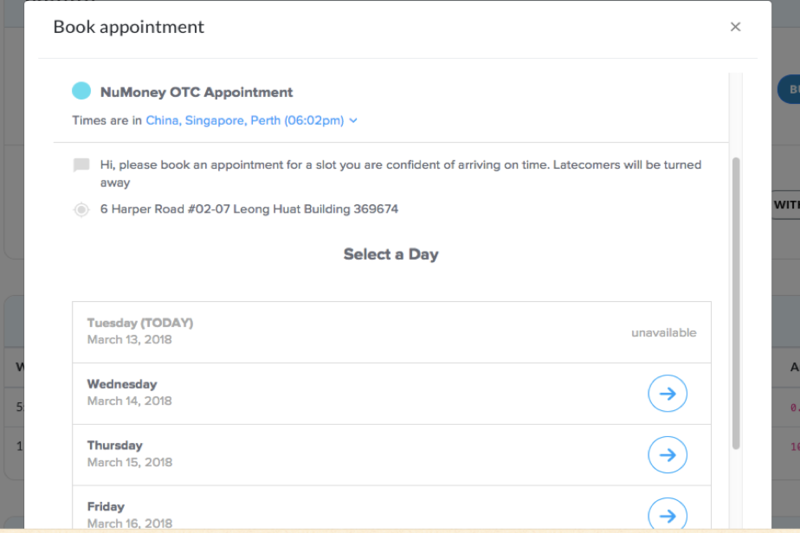 Make an appointment to withdraw cash with NuMoney Singapore. Drop us an email at [email protected] if you have any inquiries. However, emails may take as long as one working day and most problems are not resolved in the first response. This brings us to the next solution. Chat widgets are a superior form of support compared to email support because each query gets a dedicated staff synchronously addressing the issue until it is resolved. Chat widgets will be the default and preferred form of customer support for NuMoney Exchange. Type in your questions in the chat, and we'll be more than happy to reply from there. Click the bottom right of your screen at our website to get started. Other than doing otc, customers can also head down to our physical shop if you have any questions. 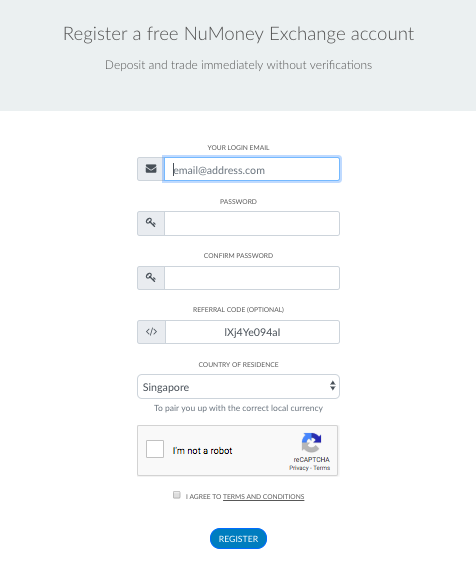 To be able to start trading/depositing fiat/withdrawing fiat in the Malaysia exchange, you will first need to verify your account. This is a recommended option for people who are neither in Singapore, Malaysia or Indonesia and do not have a bank account in those countries. Etheruem can be traded in all markets. Quick buy and sell will be executed in the default currency. Step 2: You will be brought to this page. Copy the referral URL and send it to a friend who does not have an account with NuMoney Exchange. Step 3: The URL will bring you to this page to register an account. Step 5: If your friend signs up and gets their account verified, NMX token will be credited to your account. Read here to find out more about the referral programme. With the new update on NuMoney exchange, there is an option where users can choose the currency that they want to trade in. Step 5: Sign up and start trading!